Wanting to establish a business of your own? Want to become the best in your field? Want to shock everyone and make that change of a lifetime? If the answer is a yes, then this post is what you should be reading right now. Becoming an expert is not easy at all! But if you try, success will be yours for sure. 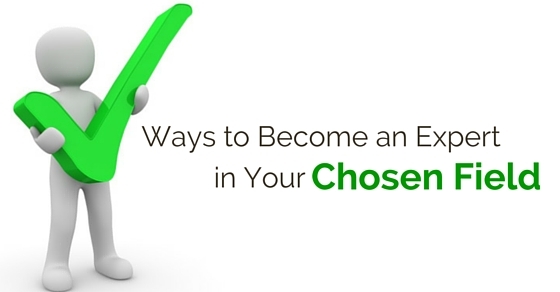 To know how to become an expert in your chosen field and reach your goals, read this post. Here you will learn about gaining insight about the industry, ways in which you can become more successful in your field and establish a good name for yourself. The following points are tried and tested and promise to help you throughout! One of the best things you can ever do in order to become an expert is simply making yourself more conspicuous to the crowd. You obviously want more people to notice and see you. So make sure you are stepping out there and interacting with more people. Even though public speaking can get a bit too scary at times, we assure that some participation and practise will help out in some ways. In short, try to make yourself more approachable to others. You may also check the net for inspirational speeches so that you can become better in your field. A second thing you should do is speak to those who you can help you learn something. There are plenty of successful people out there who want to teach others new things. You should attend their seminars and gigs so that something new can be learnt every day. They will help you gain a better perspective on life and what you can done in order to improve yourself in front of the audience and become the expert you have always wanted to. Just try to see ways in which you can become successful like them. Just by noticing their behaviour, you can learn a lot. A third tip you could try is taking some time in order to prepare. Focus on the way you speak. See how you can improve them. Try to improve the projection of your voice and try to make yourself more appealing to the audience. Spend some time alone and before you know it, a good opportunity will always come along. Just make sure to rehearse and practise enough every day. That is really all you need to become an expert! If you want the radio to interview you, speak to the host of the show. You will be able to find all information about the show along with the contact number and the email address on the website itself. When you speak to the host, also let them know why you think you would be perfect for their show. Now the radio is not the only way to get in touch with people. Social media is also there. You can try Facebook, Twitter and several other outlets where people can hear and speak to you. You may speak to some who have been a part of these big events that take place often. Try to get yourself an invitation. You never know where it can go! Now this is something that will definitely help you in the long run. If you want to become successful, you need to come up a plan… a plan that is suitable and one that will work. You have to write it down on a piece of paper and then consult an expert in order to check whether the plan you have come up with can be used for not. Doing this will not only make sure that you know what you are doing but also help you achieve success faster. You should always outline the plan so that you can have a proper outcome which is far more satisfying than anything else. The internet has a whole lot of opportunities for those who would like to learn. There is a whole lot of information available in abundance just for you. Not only will that help you learn new things but also gain more insight and learn about the different things in your field that could definitely take you a long way. You could use the search engine in order to check the topics which could give you enough information about what you are hoping to learn. They will also let you know about stuff that is new and how you can use it to your advantage in the future. Nobody can do anything alone. When you need someone to help you, go ahead and ask them for it. There are plenty of people out there who are probably going through the same situation as you are and can definitely help you in some ways. It doesn’t matter which field you are in right now, asking experts is definitely a smart choice and a good thing people do these days. It is a great way to gather more knowledge, learn new things and hopefully become the expert you want to! Whenever you are trying to become an expert in any kind of field, remember that slow and steady wins the race. They can really help you become the best. People who always in a rush might not always be able to get what they want! Not only do these guys end up making the biggest mistakes but also go through a tough time while trying to become experts. And so if you want to avoid something like that, be slow but be steady. Okay let’s be clear! Nobody is perfect! Everyone has some flaw or the other. And if you know where you are wrong, then go ahead and make those changes. If you need to improve yourself in some places, let nobody stop you from doing that. In case you don’t know where you are going wrong, analyze yourself or ask someone who knows you well to see where the changes can be made. This is your time to hone all your talents and ensure you are going in the right direction. So get ready to convert your weaknesses to your strengths. This is also an important point that should never be missed out on. If you want to become the best in your field, it is also important that you learn all the basics. When you do that, you will have a strong backup and a background. This will help you improve yourself in certain places or maybe even a specific area. Some people know nothing about certain sections of their field. If you have trouble like that, just make the necessary changes. That’s it! A lot of people try to please every single person when they are trying to become experts. If you are one of them, then you should simply stop right there. Please know that doing a whole lot of things at one go by not the healthiest thing to do, especially if it comes to dealing with clients. You should focus on a smaller amount of people. This will always help you understand things better and in that way you will be able to boost your marketing skills. Not only that, you will improve the art of speaking to people, pleasing and appealing to them. There are several media outlets who are constantly looking for people in the industry from whom they can learn something and help others as well. So instead of thinking they will manage to get some expert, you should go and pitch a couple of publications and offer yourself. See if some guest blog wants to feature you. If you really want to try, there will be plenty of bloggers and blog series who can help you. Plus always remember that you will be focusing on educating people and your audience. You aren’t trying to sell your brand here. You are trying to become an expert! If you want to become an expert, you should learn to behave like one. Always be ready to learn something new. Observe more and explore yourself. Share what you have learnt with people near you. In case, you have discovered some new idea or technique, talk about it when you are attending a class. If you are giving a speech, talk about it there as well. People should know how much these things are important to you. In that way, they will always believe your speeches. It could help you reach the top! Now this is something you have to follow in every path of your life. Always keep yourself open enough in order to learn something new. Read some more books, attend a few more classes online so that you can gauge the experts have to tell. The more you learn, the more you will be able to understand the world and what needs to be done in order to become the professional you want to. Learning new things will definitely take you a long way which is why we think its wise to keep an open mind. According to several experts, we happen to be the average of five people we usually like to spend time with. . Now isnt that shocking? You should always think of the 5 people who are there for you. If you want to step up your professional game, you have to make sure to be with people who elevate and help you. Expertise is always contagious. When you spend time with people who are very much experts in your own field, you will be able to naturally catch some of the wisdom. Before you start panicking and all that, let us first tell you that this is far easy than you think. There are several start ups these days that let people like you connect with experts of any field who want to learn new stuff. Classes are conducted online and sometimes locally and can definitely help you if you want to learn. It would be a great way to learn new things, absorb yourself and become the expert you want to. People who are growing as entrepreneurs are always eager to learn new things so you can also meet them and share your personal experiences. If you want to become an expert, always know that it will be difficult at first. Of course it is hard but it is surely possible. All you need to do is collect more materials to learn and put in enough effort. These qualities are always needed in order to become an expert in any field you choose. Even though it takes time and often differs from person to person, you can still become the best if you try hard enough! With that, this post will now come to an end. If you want to become an expert, these are some of the points that you need to follow. So make sure to follow all of them and leave us some feedback is in a comment box below. We would also love to hear your questions. Don’t forget to post them either! On that note, good luck!